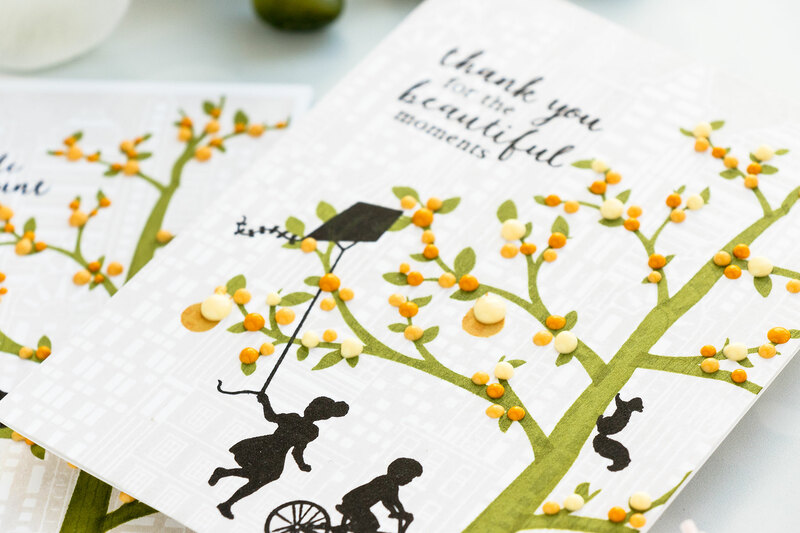 Hello everyone and thanks so much for stopping by to help celebrate the launch of Hero Arts May 2018 My Monthly Hero Kit (more about the kit, blog hop and giveaway below). 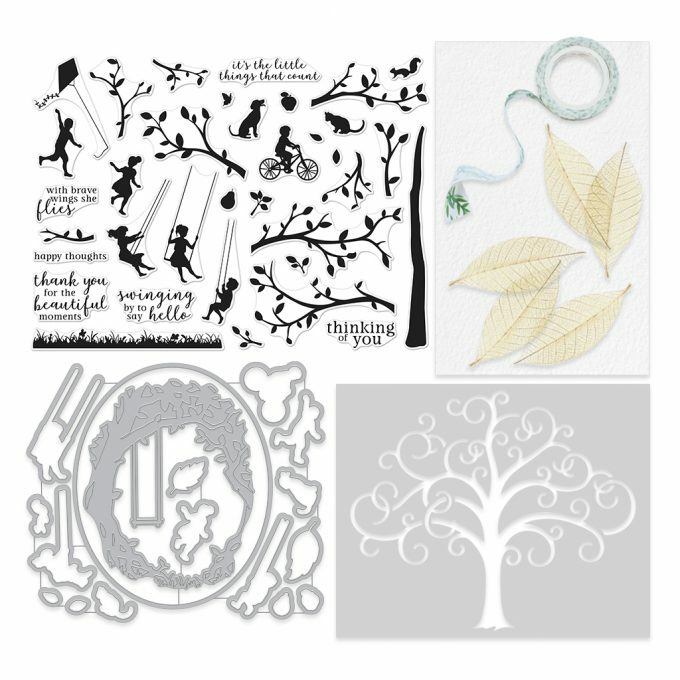 I have a few card ideas to share using this month kit only (no add ons) plus some older Hero Arts products from my stash. 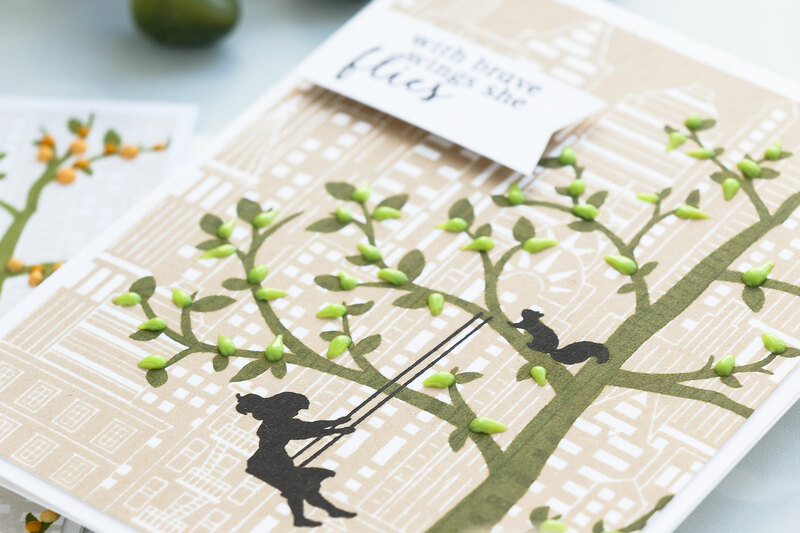 This month kit stamp set features a tree that consists of parts and pieces that lets you create your own tree. You can customize it however you want and really make it your own. 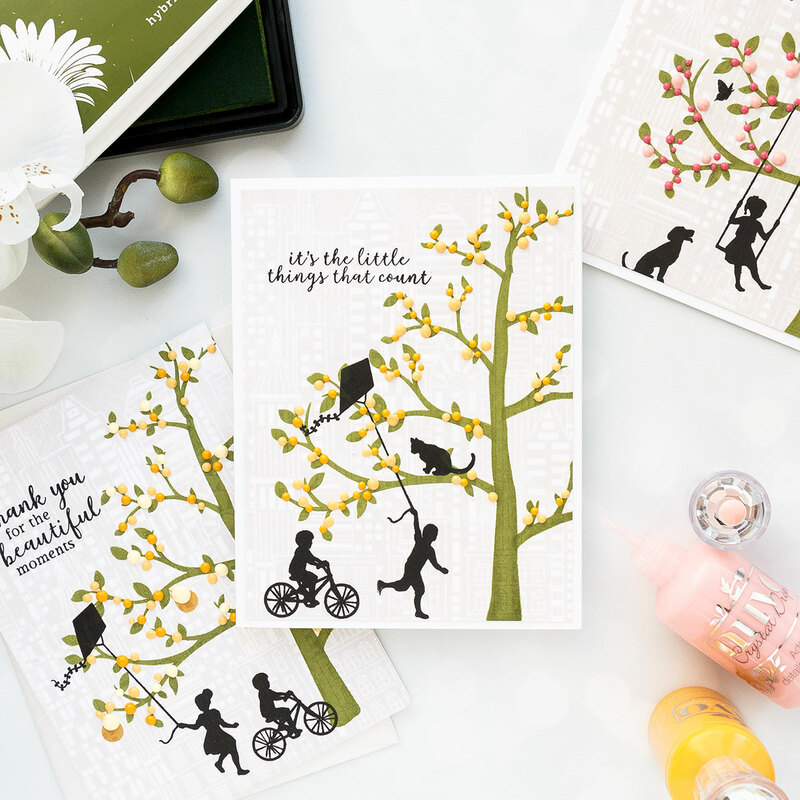 I stamped 4 identical trees for my cards and made slightly different projects. 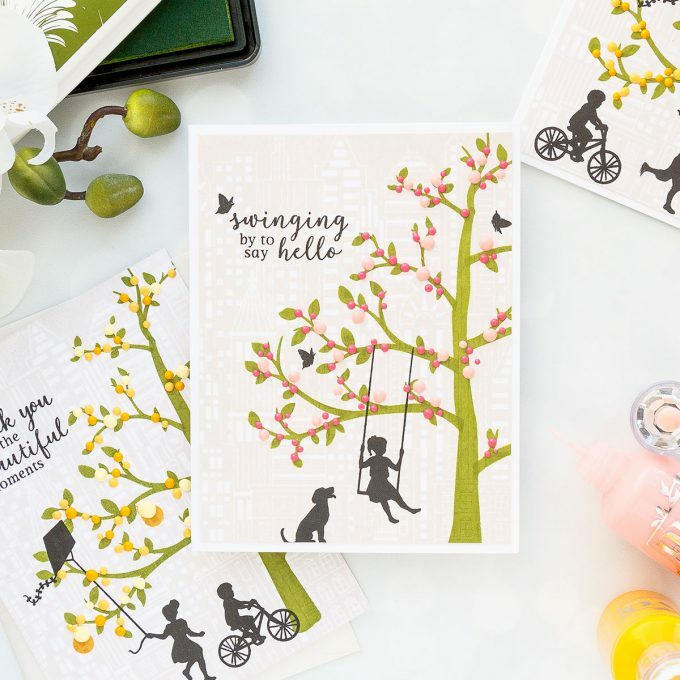 I used Moss and Forever Green inks for stamping. I thought about creating a city scene with lots of skyscrapers in the backgrounds and the large tree and kids silhouettes in the foreground. 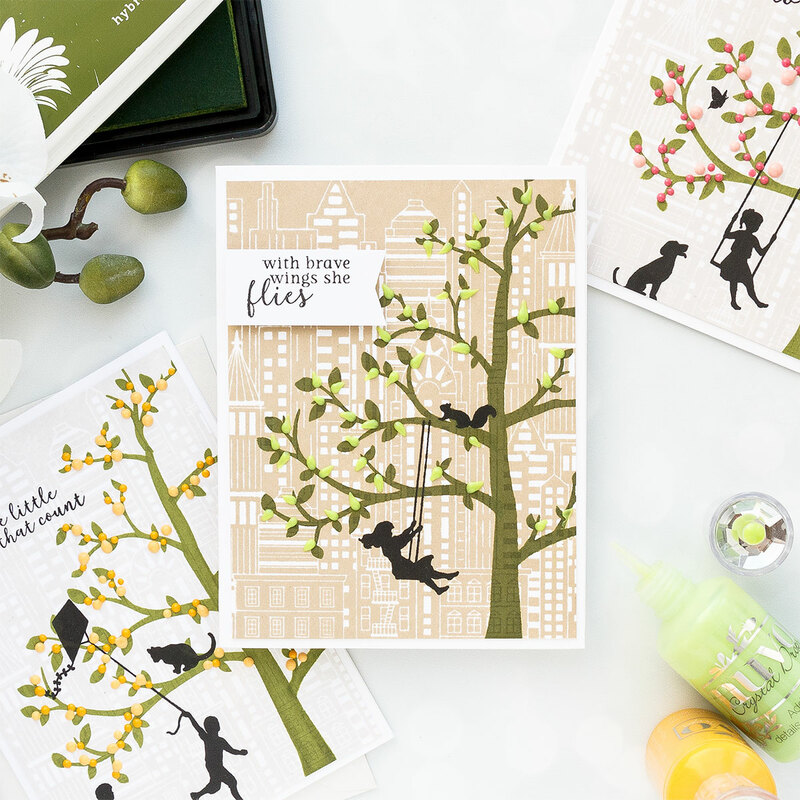 To make my backgrounds I picked the Urban Skyline background 6×6 cling stamp and stamped it using very light colors of ink – Fog by Simon and Soft Brown by Hero Arts. 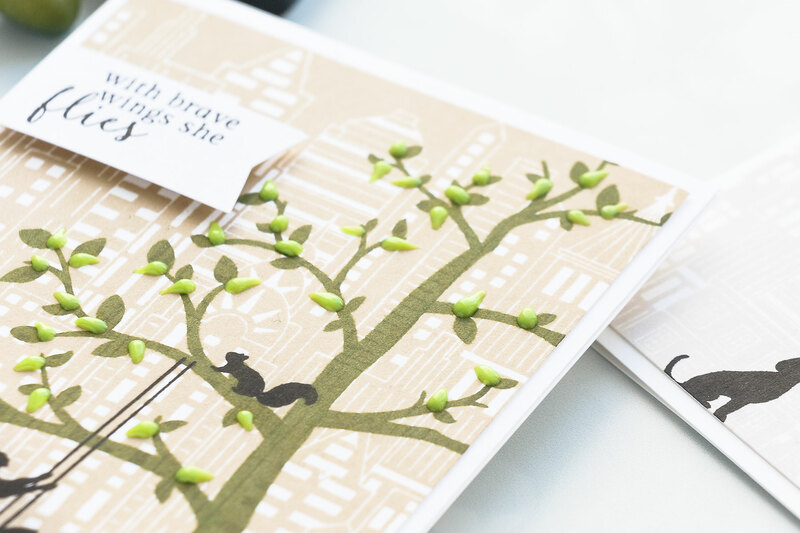 to make the tree less tall you can mask a part of the tree trunk and stamp it so that it’s not as tall as it is in the stamp set and again, just use less branches to make it into a smaller tree. 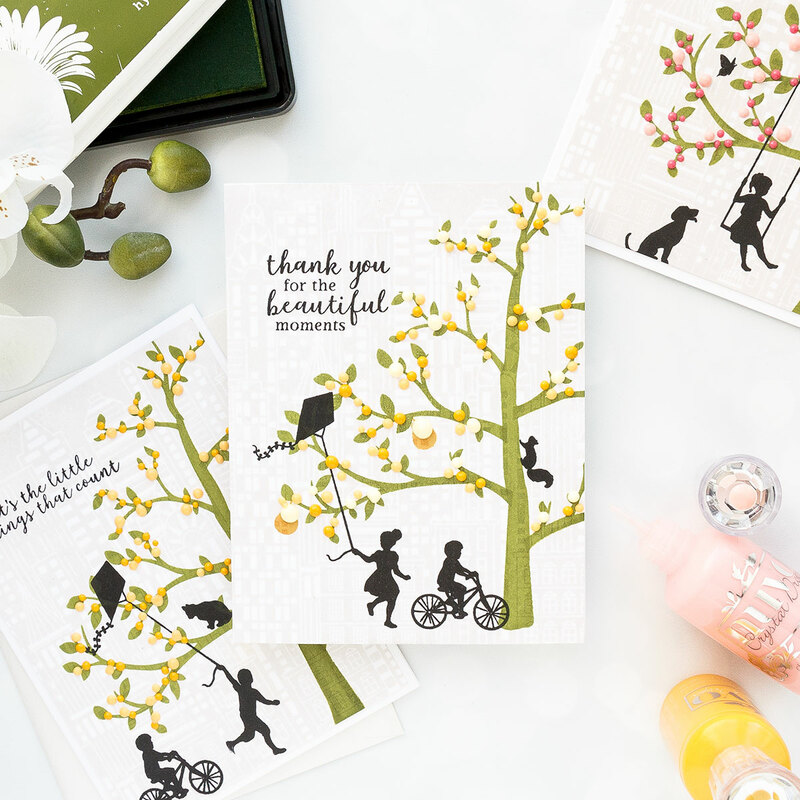 I stamped children silhouettes in black ink and I used various images + sentiments for my cards. 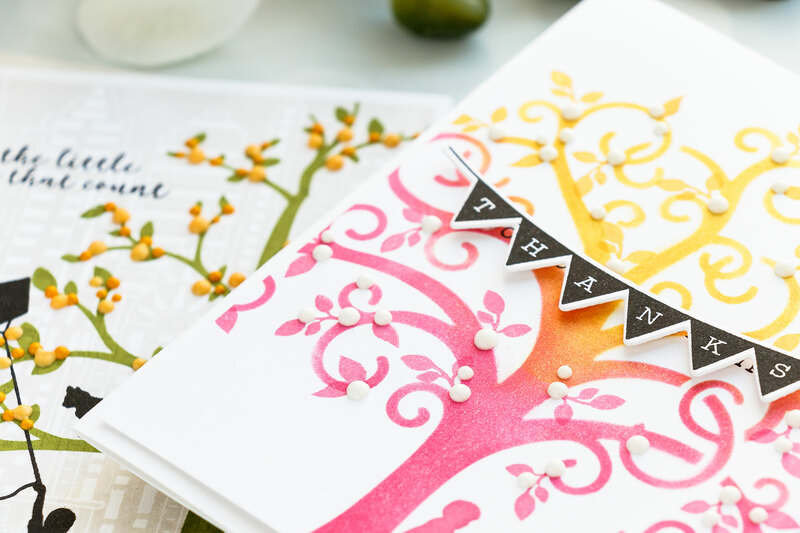 I wanted to add flowers to my tree and I actually looked through my stash in search of a small flower image that I could stamp, cut out and foam mount on the tree, but I later decided to use my Nuvo Drops instead and just add colorful drops to the branches to imitate flowers. 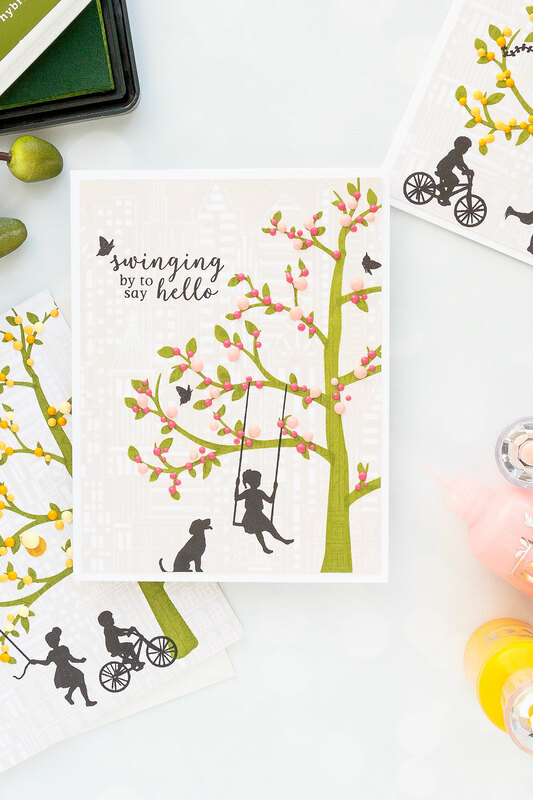 I used several colors of drops from my stash – Mustard Yellow, Buttermilk, Sugared Almond, Bubblegum Blush, Carnation Pink and added lots of various size drops to make flowers. 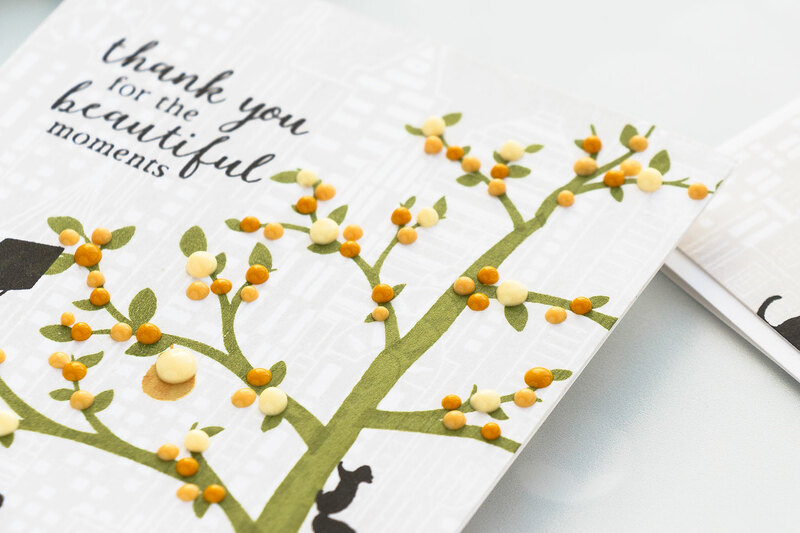 I also use green Nuvo Drops in Green Apple and added leaves onto my soft brown background card. 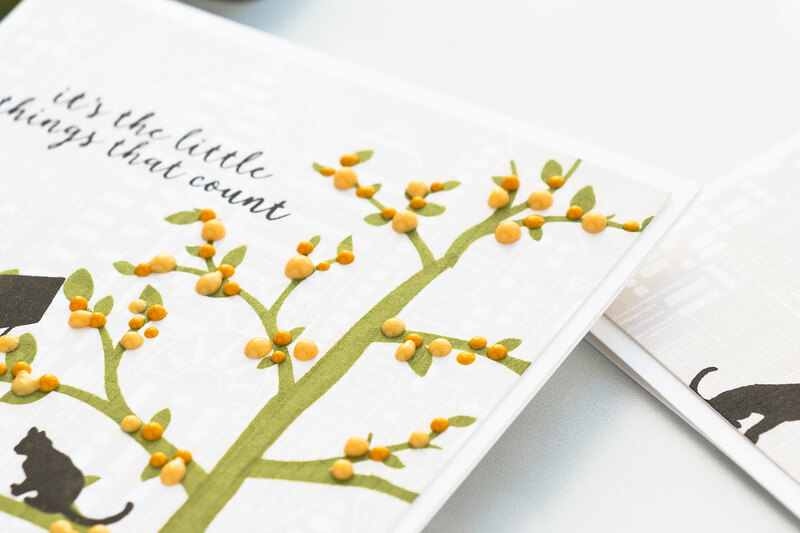 I started with the dots and used the pokey tool from my Tool ‘n One to change the shape of each dot to look more like a leaf and not like a dot. 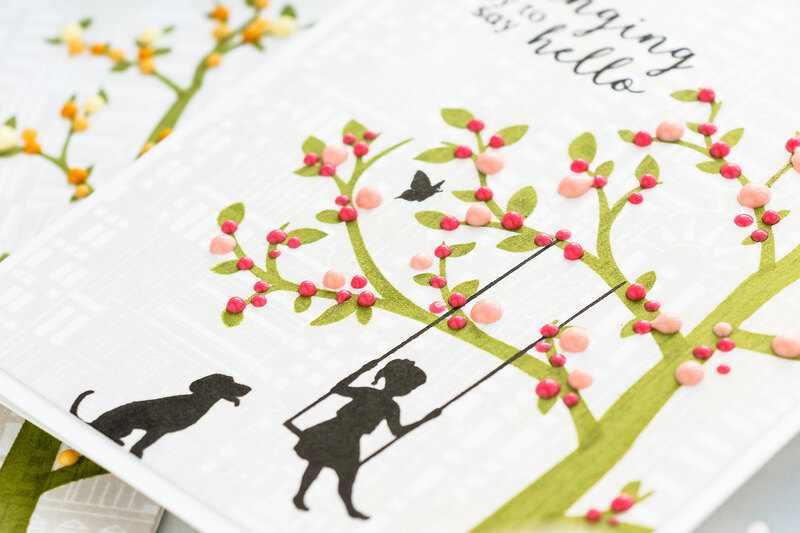 I also have one more quick card to share using the stencil that it also a part of the kit this month. I used Butter Bar and Rose Madder and ink daubers and did some quick ink blending. 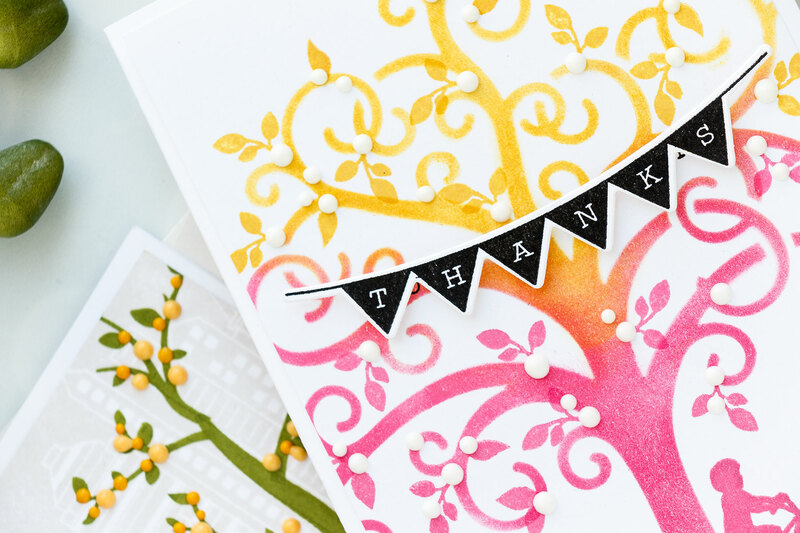 I stamped a thanks Banner from an older stamp set by Hero Arts, cut it out with a coordinating die and foam mounted it onto the background and also stamped little branches using same ink color I used for my ink blending to add some leaves to the background. 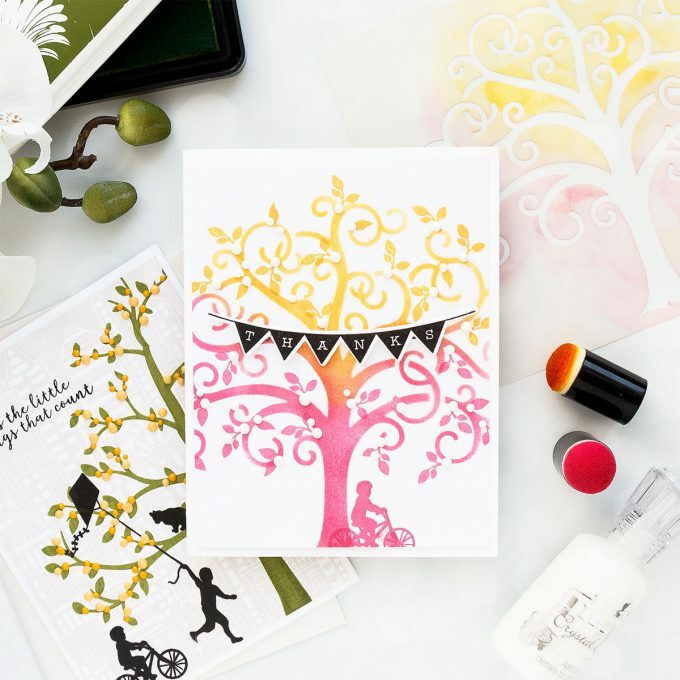 I love the tree stencil! Yana, I absolutely love what you’ve done with this kit. Your trees are gorgeous. Those cards are delightful! I love what you did with the trees! Guess I need some of those nuvo drops! I did buy the card kit! I wasn’t sure that I would like this kit until I saw your video. 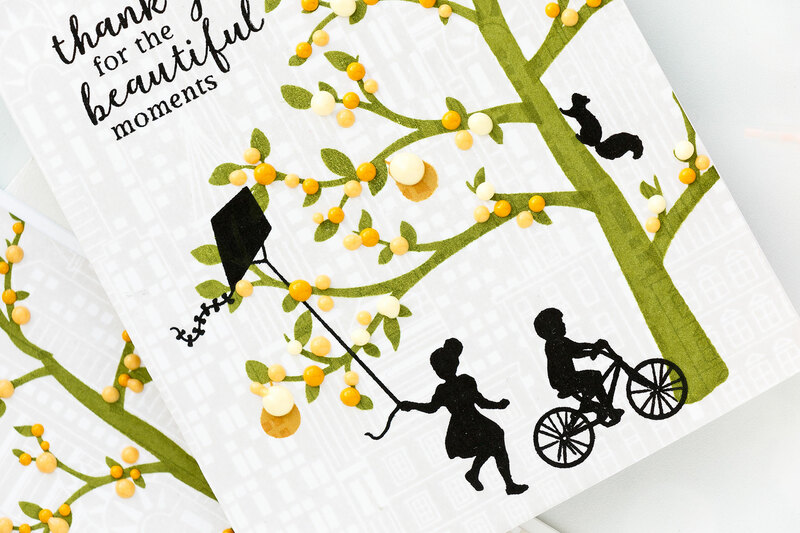 The background stamp is great with the tree and silhouette images. Thanks! Fabulous cards! I love the look of the skyscrapers behind the beautiful trees! 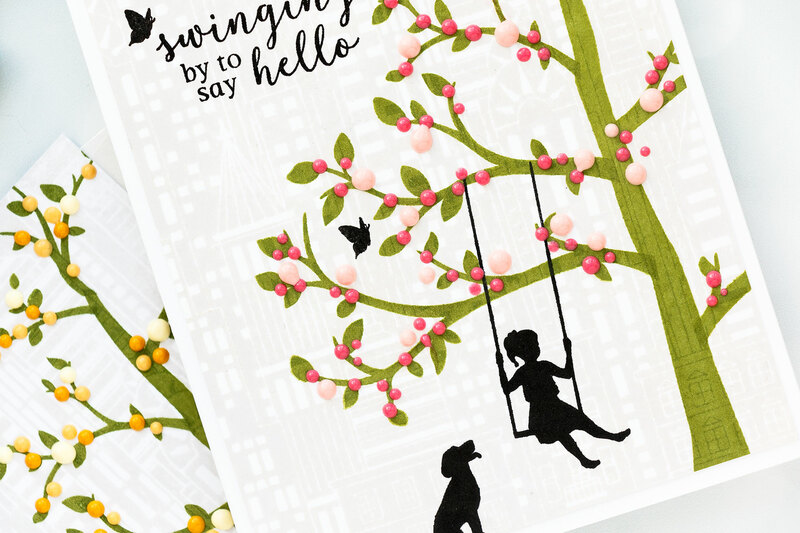 I love trees and tree swings and swinging, so I’d love to win this Kit also! Love all of your cards Yana! So much inspiration! Love your cards they are amazing. 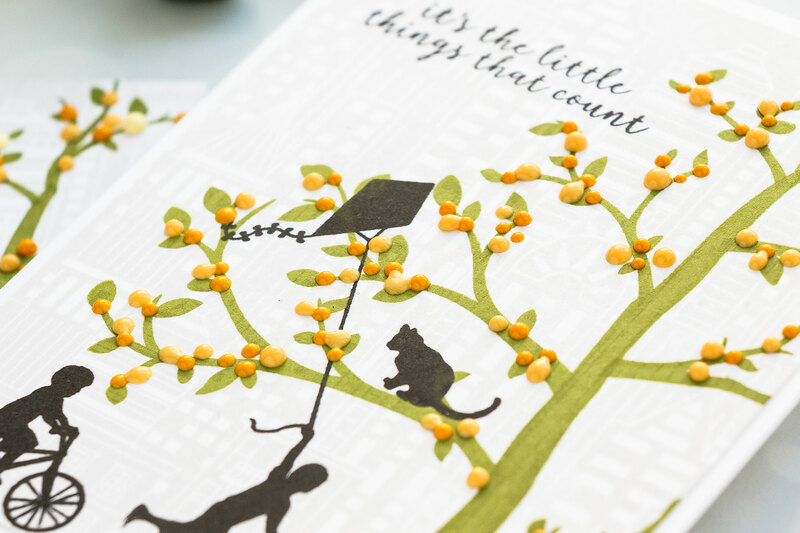 Always enjoy the blog hops all the wonderfully creative ideas.